The village of Belchin is located only 15 minutes away from the r. c. Borovets, and at the same time it is far from the noise and traffic of the big tourist center. The resort is accessed from the village through a first class inter-town road. The proximity of Belchin to the winter sports facilities of Borovets as well as to the ski-zones with a lower working capacity of Govedartsi and Malyovitsa is conducive to the offering of alternative possibilities for rest and recreation to the ski tourists in combination with the available mineral water springs at the Belchin Baths and the development of the eco and cultural tourism in the area. Borovets is the oldest winter resort in Bulgaria. Its geographic location, natural features, and traditions in offering winter tourism products are the basis for the availability of excellent conditions for winter tourism - skiing, snowboarding, ski-running and biathlon, tracking. The slopes of the Rila Mountain are covered in snow from mid-December to April. The ski zone of Borovets is situated from 1,350 m. up to 2,500 m. above sea level at the foot of the Musalla peak (2,925 m.). 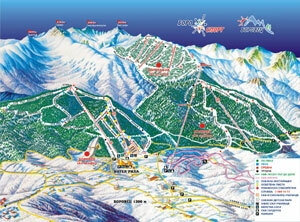 Currently, the resort has 18 ski tracks with an overall length of above 42 km. The tracks offer various levels of difficulty, and can satisfy the needs of beginners, medium level, and advanced skiers. The ski lift system is well organized and includes 1 gondola, three 4-seat chair lifts, and seven shorter cable lines with an overall capacity of 14 800 skiers per hour.